Here we show that long-lasting excitability elevations can be induced in the human motor cortex by weak continuous transcranial direct current stimulation (tDCS). In animals, anodal cortical stimulation of 5 to 30 minutes in duration caused excitability elevations lasting for hours after the end of stimulation,4 which were protein synthesis dependent5 and accompanied by an increase in cyclic AMP levels.6 In a recent study,7 we showed that by using anodal tDCS with a maximum stimulation duration of 5 minutes in the human, a motor cortical excitability elevation is induced that outlasts the end of stimulation for minutes and that the endurance of this effect is dependent on stimulation intensity and duration. The aim of this study was to investigate if it was possible to induce prolonged changes through a further prolongation of tDCS. Current stimulation of motor cortex. Current (1 mA) was induced through saline-soaked sponge electrodes (surface 35 cm2), the anode positioned above the motor cortical representational field of the right abductor minimi muscle (ADM), as revealed by TMS. The cathode was placed above the contralateral orbita. It was delivered by a specially developed, battery-driven constant-current stimulator. Constant-current flow was controlled by a voltmeter. tDCS was delivered from 5 to 13 minutes in 2-minute steps in separate sessions. The current intensity and duration we used did not exceed safety limits stated.8 Also, the results of animal studies indicate solely functional cerebral changes following even longer and more intense DCS.6 For safety reasons, concentrations of serumneuron-specific enolase (sNSE), a sensitive marker of neuronal damage, were measured in five subjects before, immediately after, and 1 hour after the end of 13-minute anodal tDCS. Measurement of motor system excitability. To detect current-driven changes of excitability, motor-evoked potentials (MEP) of the right ADM following TMS of its motor cortical representational field were recorded. Magstim Rapid-Stimulators (Magstim, Dyfed, UK) and a figure-of-eight coil were used for the magnetic stimulation. The coil was held tangentially to the skull with the handle pointing backward and laterally at a 45° angle to the sagittal plane. Stimulation intensity was adjusted to achieve a baseline MEP of about 1 mV. Additionally, in two subjects, motor cortex excitability was measured by transcranial electric stimulation (TES), with the anode placed above the representational field of the ADM and the cathode above the vertex. The MEP of the ADM were recorded by use of Ag-AgCl electrodes in a belly-tendon montage and a laboratory computer, using the Neuroscan system (Neuroscan, Herndon, VA). Twelve healthy subjects (five women, mean age 24.5 years) participated. All gave written informed consent. Those who were ill, pregnant, or drug abusers or had metallic implants/implanted electric devices were excluded by an interview and a short physical examination. The local ethics committee approved the experiments, and we adhered to the standards set by the Declaration of Helsinki. Subjects were placed in a reclining chair, and then the motor cortical representational field of the right ADM was identified using TMS (coil position leading to the largest MEP amplitude) and marked with a pen. tDCS electrodes were placed, and 20 baseline MEP of the ADM were recorded by TMS (frequency during the whole experiment 0.25 Hz). tDCS was then performed. After the end of tDCS, MEP were recorded to cover the time course of excitability changes every 5 minutes for 1 minute in the first hour and afterward for 1 minute every half hour (15 MEP). A repeated measurement design was performed: Each subject participated in all tDCS conditions (stimulation duration from 5 to 13 minutes). The order of application of the different tDCS conditions was randomized. Between each session, a free interval of 1 week was obligatory. Two subjects participated in the TES experiment. A randomized series of 20 each of TMS and TES stimuli (frequency 0.25 Hz) was applied before and after 13 minutes of tDCS. MEP size determination (peak-to-peak amplitude) was carried out automatically by a self-designed computer program. The mean value was calculated for each measured timepoint. 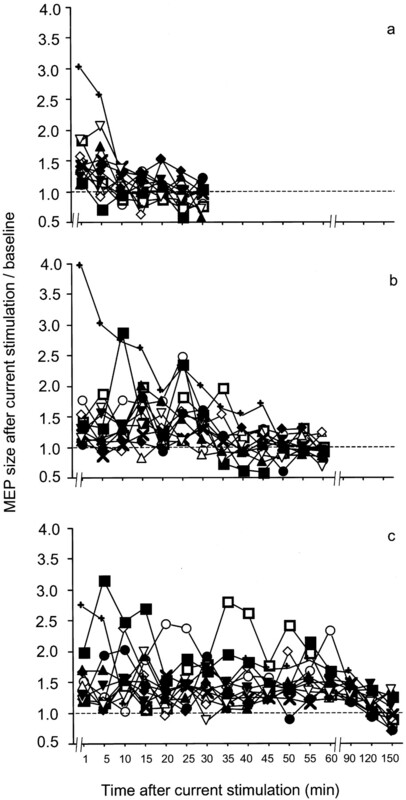 MEP amplitude means after tDCS were normalized; they are given as a post-/pre-tDCS (baseline) quotient. Analyses of variance (ANOVA; independent variable: time course after tDCS, dependent variable: MEP amplitude) were calculated for each tDCS condition, and post hoc tests (Fisher’s protected least significant difference, level of significance <0.05) were performed to compare the baseline MEP amplitudes before current stimulation with those afterward. SNSE values before and after tDCS were compared by Student’s t-tests (paired samples, two tailed, level of significance <0.05). All conditions led to post-tDCS increases of TMS-elicited MEP amplitudes. We elicited current-driven MEP amplitude elevations, which lasted up to 90 minutes after the end of tDCS, as shown in figure 1 and by the results of the ANOVA (table) and the post hoc tests. Here, the time course of the tDCS after-effect is stimulation duration dependent: Whereas 5- and 7-minute tDCS resulted in after-effects lasting for no longer than 5 minutes, tDCS from 9 to 13 minutes resulted in elevations of MEP amplitudes from 30 (9-minute tDCS) to 90 (13-minute tDCS) minutes. These elevations are in the range of about 150% above baseline values. However, a certain interindividual variability of effect size was noticed (figure 2). For the longer tDCS, MEP show no linear decrease for a relatively long time but are fairly stable before returning to baseline levels. Regarding the TES experiment, TES-elicited MEP amplitudes did not rise following tDCS (means: 819 μV before, 753 μV after tDCS), whereas TMS-elicited MEP amplitudes did in the same experimental session (means: 1,164 μV before, 1,685 μV after tDCS). SNSE concentrations did not change after 13-minute tDCS (pre value: 8.3 ng/mL; immediately after tDCS: 8.1 ng/mL; 1 hour after tDCS: 8.5 ng/mL; t-tests: NS). Figure 1. After-effects of anodal transcranial direct current stimulation (tDCS) on motor cortical excitability. Time course of poststimulation motor cortex excitability changes is shown after 5 to 13 minutes of tDCS with 1 mA. Note that after 5- and 7-minute stimulation, the motor-evoked potential (MEP) amplitudes return to baseline within the first minutes after stimulation, whereas 9 to13 minutes of stimulation results in after-effects remaining for a maximum duration of 1.5 hours after the end of stimulation. Symbols indicate tDCS duration: circles = 5 minutes, diamonds = 7 minutes, upward-pointing triangles = 9 minutes, downward-pointing triangles = 11 minutes, squares = 13 minutes. Filled symbols indicate significant differences between MEP amplitudes after stimulation and baseline (Fisher’s protected least significant difference post hoc test). Standard errors are not shown for the sake of clarity; mean of standard error is 0.063 (minimum 0.045, maximum 0.075). Figure 2. Intraindividual motor cortical excitability changes after transcranial direct current stimulation (tDCS). Individual excitability elevations after 7 (a), 9 (b), and 13 (c) minutes of tDCS are depicted. Each symbol represents motor-evoked potential (MEP) values of one subject. MEP amplitudes are normalized to baseline values individually. Supported by Deutsche Forschungs-Gemeinschaft grant PA 419/9-1. Ziemann U, Corwell B, Cohen LG. Modulation of plasticity in human motor cortex after forearm ischemic nerve block. J Neurosci . 1998; 18: 1115–1123. Stefan K, Kunesch E, Cohen LG, Benecke R, Classen J. Induction of plasticity in the human motor cortex by paired associative stimulation. Brain . 2000; 123: 572–584. Abbruzzese G, Trompetto C, Schieppati M. The excitability of the human motor cortex increases during execution and mental imagination of sequential but not repetitive finger movements. Exp Brain Res . 1996; 111: 465–472. Bindman LJ, Lippold OC, Redfearn JWT. The action of brief polarising currents on the cerebral cortex of the rat (1) during current flow and (2) in the production of long-lasting aftereffects. J Physiol . 1964; 172: 369–382. Gartside IB. Mechanisms of sustained increases of firing rate of neurones in the rat cerebral cortex after polarization: role of protein synthesis. Nature . 1968; 220: 383–384. Moriwaki A. Polarizing currents increase noradrenaline-elicited accumulation of cyclic AMP in rat cerebral cortex. Brain Res . 1991; 544: 248–252. Nitsche MA, Paulus W. Excitability changes induced in the human motor cortex by weak transcranial direct current stimulation. J Physiol . 2000; 527: 633–639. Agnew WF, McCreery DB. Consideration for safety in the use of extracranial stimulation for motor evoked potentials. Neurosurgery . 1987; 20: 143–147. Bennett MR. The concept of long term potentiation at transmission of synapses. Prog Neurobiol . 2000; 60: 109–137. Rosen SC, Stamm JS. Transcortical polarization: facilitation of delayed response performance by monkeys. Exp Neurol . 1972; 2: 282–289.